Scientists at the University of Bern, Switzerland, determined that spiders use these scuba tanks, called air bells, as reservoirs, monitoring and replenishing oxygen levels to enable the animals to live underwater. 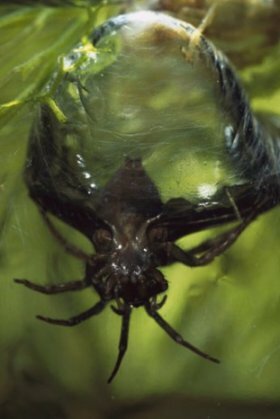 “The water spider’s air bell is in some ways working like an external lung,” said study co-author Michael Taborsky. But it also serves as a safe place from terrestrial predators and as a safe nest in which to keep her eggs and tend the young spider lings. But as it saves from outside danger, it also is used as a safe harbor for consuming prey and breeding. The spider uses the short hairs on their abdomens and legs to trap air bubbles from the water’s surface. This is then carried back to specially designed underwater reservoirs spun from silk. The air causes the structure to take on a bell shape and a silvery sheen. The silk membrane functions as a filter to allows oxygen to diffuse in from the water and carbon dioxide to diffuse out, so the spiders do not have to replenish the air supply often. To test if the spider has an internal air quality receptor, the team replaced the gas volume in each spider’s air bell with pure oxygen, pure carbon dioxide, or a control of ambient air. The test spiders only reacted to the carbon dioxide treatment, surfacing more frequently and increasing bell-building behaviour until oxygen levels had been sufficiently replenished. This meant the water spiders not only actively monitor the quality of the bell’s atmosphere, but that they also depend on the bubbles for underwater respiration.